MACH Portainers at the port of Long Beach. 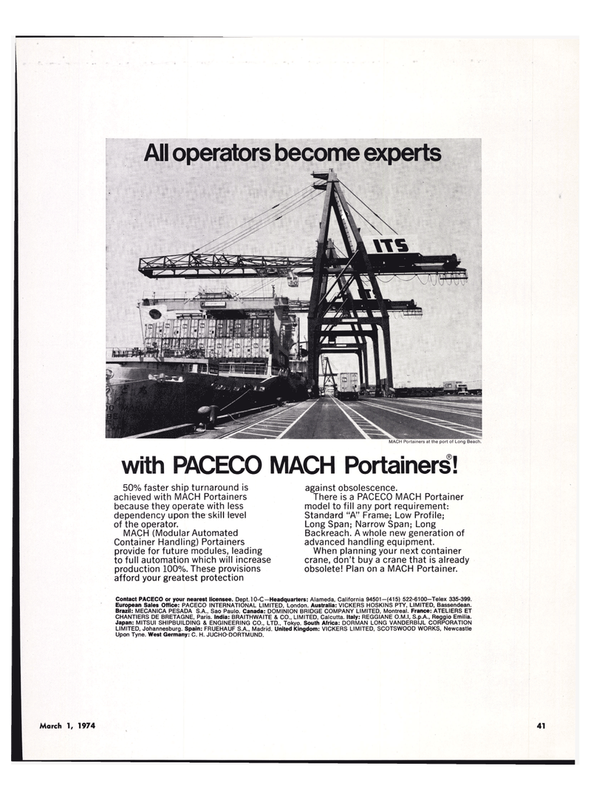 with PACECO MACH Portainers! 50% faster ship turnaround is achieved with MACH Portainers because they operate with less dependency upon the skill level of the operator. Container Handling) Portainers provide for future modules, leading to full automation which will increase production 100%. These provisions afford your greatest protection against obsolescence. Backreach. A whole new generation of advanced handling equipment. When planning your next container crane, don't buy a crane that is already obsolete! Plan on a MACH Portainer. Contact PACECO or your nearest licensee. Dept. 10-C-Headquarters: Alameda, California 94501-(415) 522-6100-Telex 335-399. European Sales Office: PACECO INTERNATIONAL LIMITED, London. Australia: VICKERS HOSKINS PTY, LIMITED, Bassendean. CHANTIERS DE BRETAGNE, Paris. India: BRAITHWAITE & CO., LIMITED, Calcutta. Italy: REGGIANE O.M.I, S.p.A., Reggio Emilia. Upon Tyne. West Germany: C. H. JUCHO-DORTMUND.